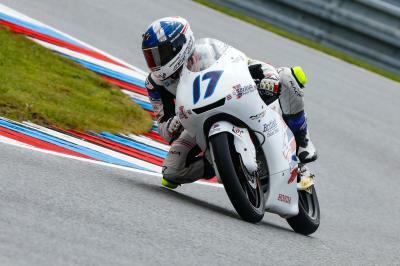 Championship leader Joan Mir (Leopard Racing) has extended his advantage after a wet weather showdown at Brno, staying in contention throughout before holding off Romano Fenati (Marinelli Rivacold Snipers) as it came down to a duel. The weather was wet as the lights went out, with the track then drying more and more as the laps ticked on. The podium was completed by Aron Canet (Estrella Galicia 0,0) after an almighty fight between the Spaniard, compatriot Juanfran Guevara (RBA BOE Racing Team) and Dutchman Bo Bendsneyder (Red Bull KTM Ajo). Polesitter Gabriel Rodrigo (RBA BOE Racing Team) got a great start from pole, with Guevara moving up from P3 to follow his teammate through Turn 1. Mir attacked Fenati into the first corner, but the Italian held firm initially before the field began to settle in and some began to struggle, some to shine. John McPhee (British Talent Team) had a fantastic initial charge from P19 into the top ten, with wildcard Tim Georgi (Freudenberg Racing Team) making up even more ground and soon battling the Scot. 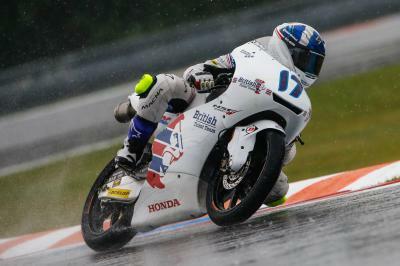 Nakarin Atiratphuvapat (Honda Team Asia) was the highest-placed initial charger, however, as the Thai rider made it up into the top four and was the fastest man on track. 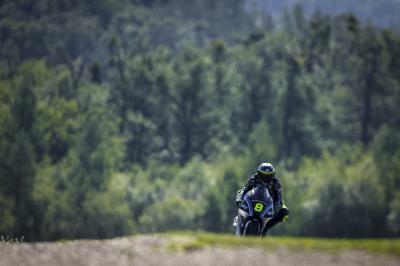 Up ahead, Guevara had taken off in the lead dueling Bendsneyder; the two clear of Mir in P3. The Majorcan, in turn, was under pressure from Atiratphuvapat and Marcos Ramirez (Platinum Bay Real Estate). Fenati was a further second back, leading another group as the field proved more spread out than the usual Moto3™ dry showdown. As the track dried out, however, a top group of four saw Bendsneyder, Guevara, Fenati and Mir off at the front – but there was a charge coming from behind. 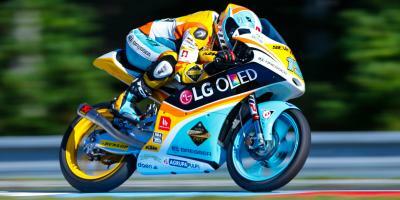 Canet, who started P17, was gaining more and more speed as the conditions improved. Mir made a break for it, followed by Fenati, leaving Canet to fight it out for the podium against Bendnseyder and Guevara, taking the honours to complete his stunning comeback. 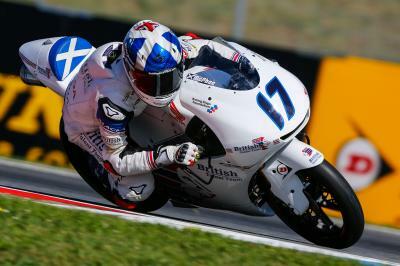 John McPhee was another who made incredible progress, gaining thirteen places by the flag to take a top six. Marcos Ramirez came home just over a second off McPhee, just in front of Tatsuki Suzuki (SIC58 Squadra Corse). Adam Norrodin (SIC Racing Team) charged hard too, taking ninth ahead of Thai rider Atiratphuvapat as both shone in the difficult conditions. Andrea Migno (Sky Racing Team VR46) took positive P11, with Albert Arenas (Aspar Mahindra Moto3) slicing through the field into twelfth. Philip Oettl (Südmetall Schedl GP Racing) faded slightly from an initial top ten placing to come home in thirteenth, only 0.005 ahead of an awesome assault through the field from Dennis Foggia (Platinum Bay Real Estate) into P14. 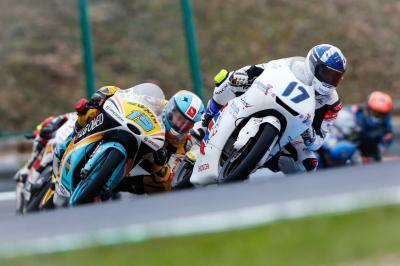 The group headed by Oettl crossed the line almost in tandem, with thousandths separating Oettl from Foggia, Ayumu Sasaki (SIC Racing Team), Tony Arbolino (SIC58 Sqaudra Corse) and Enea Bastianini (Estrella Galicia 0,0) in seventeenth. Tim Georgi, after his wet weather heroics, just lost out in the closing stages as the track dried but nevertheless took a solid P18 within good sight of the points – and certainly made waves in both FP1 and the early stages of the race. Next is Austria, where Mir took his first ever victory last season – and we don’t have to wait long, with action getting underway on Friday. For full results from Brno, click here - and Championship standings are here! Check out the session in full with VideoPass and watch everything across the #DutchGP live or OnDemand - as well as an incredible range of extra features! The full race session at the #CzechGP of the Moto3™ World Championship. Everything you need to know before lights out!